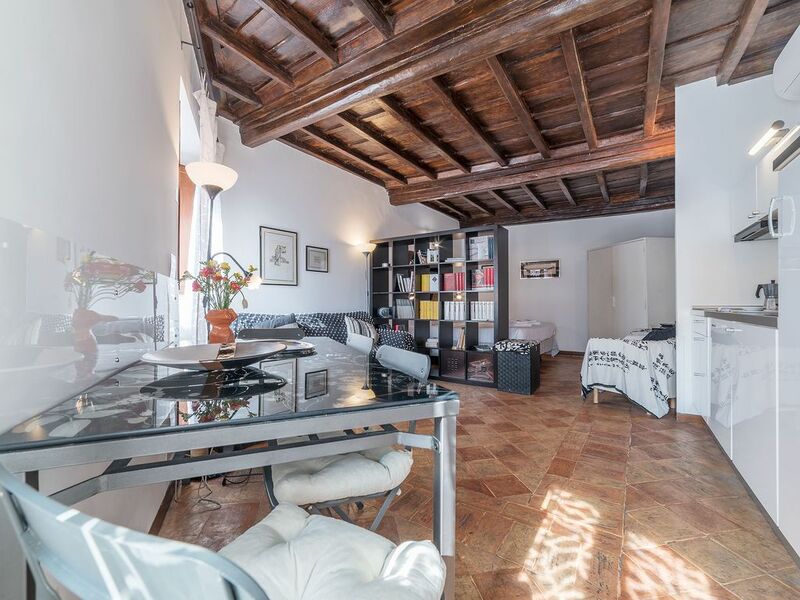 This apartment in Rome overlooks the streets San Celso and Campanella. Filled with sunshine most of the day, it is tastefully furnished in black and white. Unique for the original coffered ceiling and ancient tiled terracotta floor. The apartment, which ensures quality comfort and privacy, stretches over two floors. Max. capacity: 6 people. The main floor comprises a large hall divided into a night area (with twin or double bed) and a living area with a double sofa bed, TV, bookcase, dining table and fully equipped kitchen (i.e. glass ceramic burners, new generation dishwasher, microwave oven, espresso coffee machine, pans, glassware, ceramic ware and cutlery). Brand new bathroom with shower. A small flight of stairs leads to the top floor, which has a bedroom (with twin or double bed) and a bathroom with bath, shower and washing machine. A kitchenette fitted with microwave oven, sink and small table makes preparing and having breakfast and light snacks a pleasure. The apartment is air-conditioned. The Internet connection can be accessed from all rooms and is free of charge. Great location close to bus service. The unit was very clean but the chair coverings were quite soiled. Great water pressure in the shower. Beds were very comfortable, very clean linens. Thanks. Nice apartment in a wonderful central location! Walk to the Vatican, Coloseum, Piazza Novona and more. Great for two couples since bedrooms are on separate floors. But be aware, apartment is several flights up and there is no lift. Was nice to be in Rome anyway. Quiet building, quiet street close to everything. Comfortable beds. But 3rd floor no elevator. Wifi is poor, no CNN or France24 on Tv but you can have the Television of Iran….Low hot water pressure. I'm glad to hear that you were happy to be in Rome. I'm really sorry that you had issues with the water pressure. During your stay we did have a situation with the whole system so we went ahead and invested in a new water heater altogether - so, no more problems there. On the subject of the internet connection, we do have one of the fastest available lines in the city center, so it's definitely weird that you observed this issue. Possibly restarting the router would have fixed that for you. As per our conversation at check-in, our office is very close to the flat so you could have called (we have a 24 hours dedicated phone number for any and all emergencies) or emailed: we would have been glad to drop by and fix this for you so that your stay would have been more comfortable! Hope to have you again as a guest in one of our accommodations. We loved our stay - perfect apartment for our family of 5. Great location, very clean and plenty of space for all 5 of us. Thank you!! We recently stayed at the apartment for three nights. It was in a fantastic location, so close to shops, sights and transportation yet for all that was going on around the neighborhood, it was very quiet at night. We would highly recommend this property. It was a great central location at which to stay in Rome and very comfortable. Rome, as you have never seen it before. The river Tiber will let you discover the ancient heart of the City. You will sail from Sant'Angelo dock towards Tiberina Island continuing then up to Risorgimento Bridge. This is your opportunity to re-study 2750 years of history. Boarding: Ponte S.Angelo. Cruise time: 1 hour and 10 minutes. Price a person: € 12.00. On board of the Agrippina Maggiore, the queen of Battelli di Roma's fleet, you can enjoy a different night dining at the River Café. The traditional and tasty cuisine, the elegant and friendly atmosphere, the musical background, are the ingredients for a special night, with the complicity of Rome by night. Boarding: Ponte S. Angelo Cruise time: 2 hours and 15 minutes. Price a person: € 54.00.